The St. Columba Altarpiece depicts three religious scenes regarding Jesus Christ's birth and establishment as the son of God in Christianity. 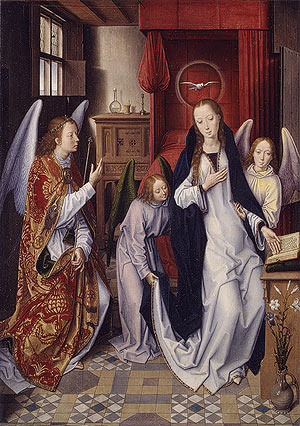 This altarpiece is divided into three panels - a triptych - representing, from left to right, the Annunciation, the Adoration of the Magi and the Presentation at the Temple. The central panel depicts this well-known scene Christmas scene in which three kings (or wise men) from the East visit the newborn baby Jesus after following a blindingly bright star. 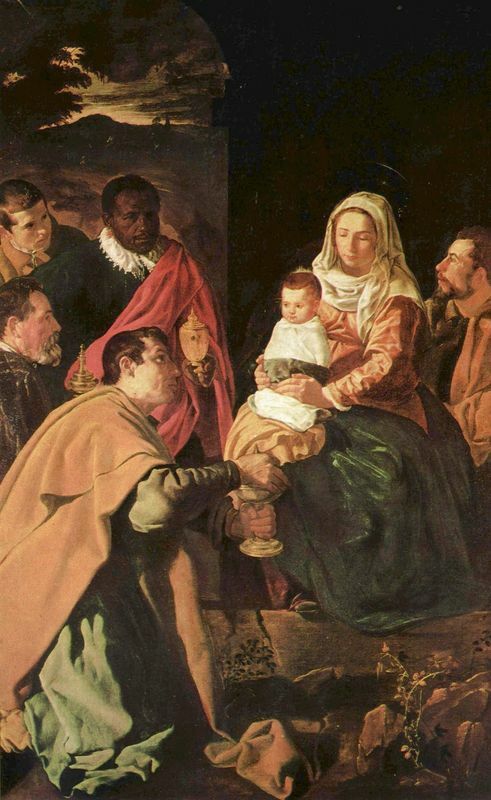 According to tradition, they presented him with valuable gifts (gold, frankincense and myrrh), thereby recognizing him as a king and declaring it to the rest of the world. These kings are typically depicted as a cohort of three, dressed in elaborate foreign fashion, who arrived just days after Jesus' birth. Historical accounts suggest that there may have been more than three of these wise men and that they were actually aristocratic astronomers from Babylon rather than actual kings. 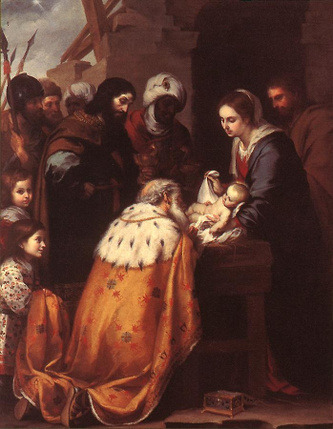 Scholars also believe that the Magi would have arrived in Bethlehem as late as two years after Jesus was born. 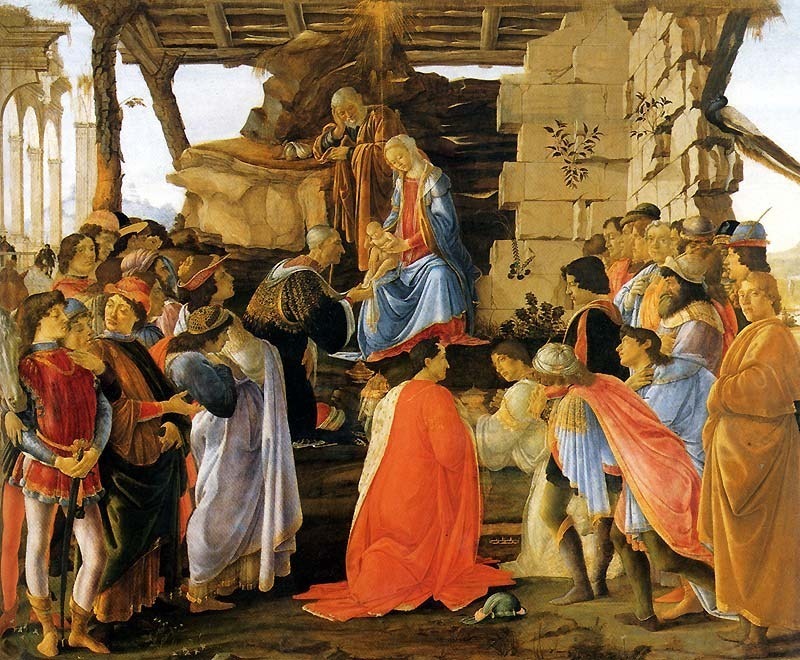 This event, widely depicted in art, is also celebrated as a part of Christmas traditions across the world on a day called the Epiphany. Furthermore, a number of cities claim to possess the bones or bodies of the three Magi. Marco Polo, for instance, was shown a set of tombs in present-day Iran which housed the remains of men (perfectly preserved) believed to have been the ones to visit the infant Christ. Germany's Cologne Cathedral, is also believed to be the final resting place of the skeletons of the three wise men. This event, depicted on the right panel, shows the Virgin Mary presenting her newborn child at the Jewish temple 40 days after his birth as part of the purification process after childbirth, and to make a sacrifice at the temple, as tradition dictated. It was also at this presentation at the temple that the prophets Anna and Simeon viewed the infant and declared that he would be the one to bring salvation. The origins of the St. Columba Altarpiece are mysterious. Although the painting was first recorded as gracing the church of St. Columba in Cologne, scholars can only speculate about who would have commissioned this work and for what purpose. Since it was painted fairly late in his life and career, Rogier van der Weyden was probably well-regarded as a superb painter with a superior workshop, and a commission would have required a significant amount of money. Other versions of the painting done by local artists suggest that this triptych may have been commissioned by the city of Cologne, Germany. The subject of the center panel, the Adoration of the Magi, holds a special significance in Cologne, where Catholics believe the remains of the three wise men lie in repose. Rogier van der Weyden's deed and work paint a picture of a religiously devout man, who strove to honor Catholic tradition. Indeed, he is known to have donated money to various charities and organizations, especially those run by the Carthusian monks since his eldest son was a member of the order. This religious conviction could have played a role in van der Weyden's take on these popular scenes and the emotive feeling his figures exude. 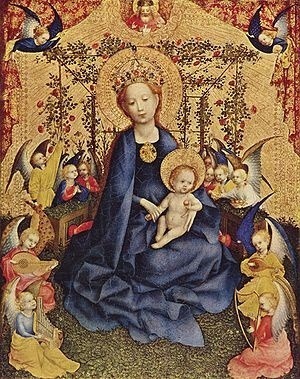 It is believed that van der Weyden drew inspiration from the artist Stefan Lochner's Altarpiece of the Patron Saints of Cologne, also known simply as the Cathedral Altarpiece. Arranged in three panels, the St. Columba Altarpiece chronicles significant events surrounding the recognition of Jesus Christ as the son of God in the Christian tradition. 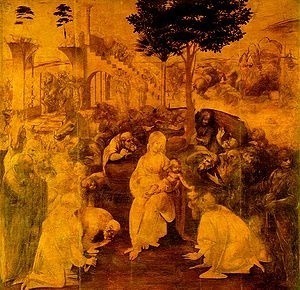 Although the idea behind the painting is the glorification of Jesus, it is his mother, the Virgin Mary, who is the only figure to appear in each frame. The figures in all three panels are primarily linked by their uniform scale and chronologic layout, rather than through a single background. These figures are arranged in a somewhat shallow composition, rather than staggered at various depths at the forefront of the painting, although the principal figures are clearly placed ahead of the others. Van der Weyden chose to use bold colors for the primary figures, especially the Virgin Mary, who is dressed in vivid blue in each of the three panels. The blue figure of Mary is set off by the rich reds that appear around her - in her bed linens, the clothing of the Magi and others, and the clothing of the priests or Simeon - helping to highlight the blue. As with all of Rogier van der Weyden's works, the detail paid to subtle emotion is evident and helps make this painting memorable. 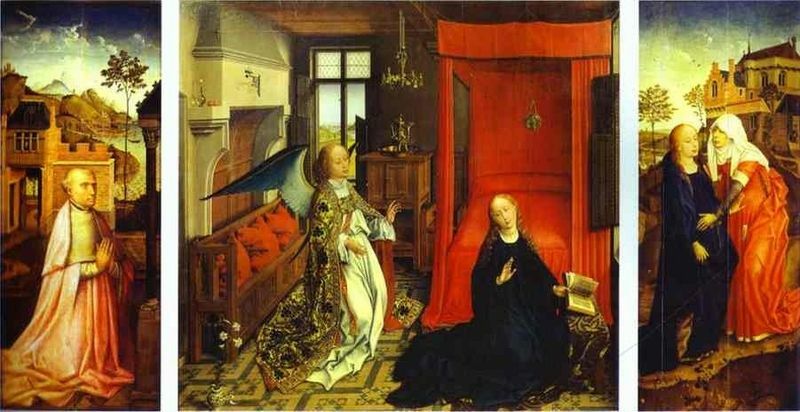 These emotions are especially evident in the face of Mary, who in the first panel seems to be somewhat incredulous or even frightened by what the angel Gabriel is telling her. 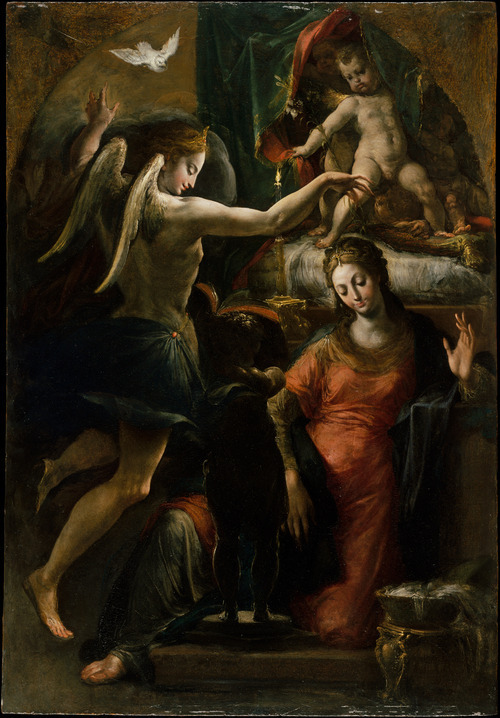 In the primary central panel, Mary's emotions are more closely reminiscent of pride, adoration and humility. These are somewhat similar to the feeling she exudes in the final panel in the temple, where she assumes a serious comportment with additional modesty. Interestingly, this altarpiece is believed to have only been designed and drafted by van der Weyden, with his contribution to the painting being small, if existent at all. Scholars believe that at this stage of his career, van der Weyden himself would have been extremely busy and amassed a number of students in a vast workshop. 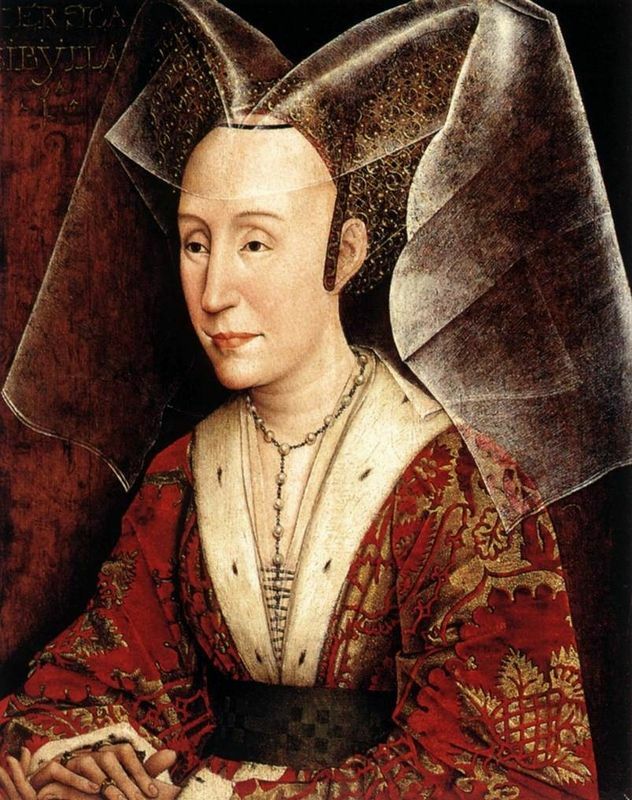 Thus it is probable that this painting was executed by van der Weyden and a number of assistants, possibly including his own son Pieter and the painter Hans Memling. Experts and art historians can determine that a number of different painters contributed to this work based on the different styles of painting the faces and hands in particular. Today's scholars believe that the St. Columba altarpiece was, indeed, revered by van der Weyden's contemporaries, although limited evidence of this admiration still exists. Something that van der Weyden's contemporaries would have appreciated about this piece is the wealth of details and general comportment of the figures, which reflected the ideals of the time and place. Today, the St. Columba Altarpiece is regarded as a finely detailed, powerful piece of art, thanks to the 'grave and aristocratic' figures van der Weyden produced. 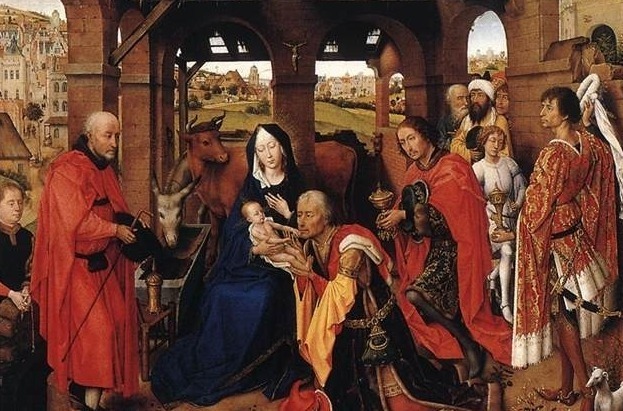 Furthermore, the central panel - the Adoration of the Magi - was regarded for a while as the only correct version of this theme, with subsequent painters relying on van der Weyden's vision to conceive of their own similar works. The St. Columba Altarpiece was rediscovered, so to say, in 1801 in a chapel founded by Goddert von dem Wasservas, a prominent man in Cologne. There is no conclusive evidence, however, that this chapel even existed during van der Weyden's death, so scholars cannot be certain that it had always been there. 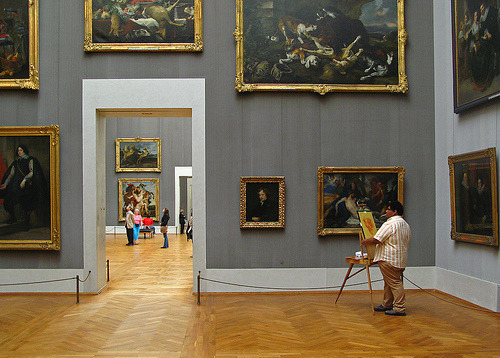 From there, it went to the Boisserée Collection, and then to the Alte Pinakothek in Munich in 1827, where it remains today. 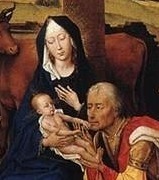 Rogier van der Weyden began tasted success very early in his career. He was seen as an innovative painter, with a fresh vision and acute sense of emotion - qualities often devoid in artists during a time when formulaic religious depictions were widespread. Artists in his workshop reprinted and imitated his works for dissemination throughout Europe. What his contemporary imitators and students could not convincingly replicate, however, was the same subtlety and 'contempt for mere representation' that van der Weyden so effortlessly achieved. 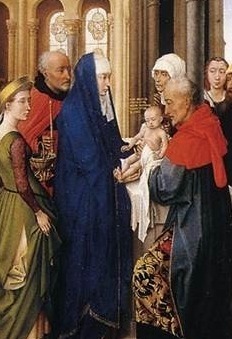 Rogier van der Weyden was remembered during the 16th and 17th centuries as a well-respected artist and man and people still marveled at his unique interpretations and subtly emotive subjects. During the 18th century, van der Weyden's name and works were all but forgotten after his most accessible and impressive work, Scenes of Justice, was destroyed in 1695. By the 19th century, however, art historians began the arduous task of piecing together the shreds of his biography and oeuvre, wading through confusing double-biographies, rediscovering manuscripts and records and attributing paintings. Today, Rogier van der Weyden is regarded as one of the pre-eminent painters of the Early Netherlandish style, lauded for his introduction of masterfully subtle emotions. He enjoys a place in art history books alongside more well-known painters like Jan van Eyck, though his own accomplishments are unrivaled. For further insight into the works of Rogier van der Weyden, please refer to the following recommended sources.